This photograph is used courtesy of Mary Tew, whose dad appears in the bottom right area. Today's Update (3/30/2019) - Today's update tells of a little known event -- The Ashpole Race Riot of 1898. Three newspaper clippings are included which constitutes the entire body of available information. This article is located under History. Previous Update (2/21/2019) - Today's update tells about the end of World War II. It contains two photos and is located under History. Previous Update (2/12/2019) - Today's update is really two different articles. The first discusses Dr. John P. Brown's last contribution to Fairmont. It is short but important. The second discusses the lack of Fairmont news from 1938 through the end of the war. Both are located under History. Previous Update (1/16/2019) - Today's update features Ansie Williams and her Town & Country Shop, a ladies clothing business which began in 1944. Features one photograph and is located under History. Previous Update (12/10/2018) - Today's update is a short one with one photo. It is located under History and is titled Ashley Oil Company - Part 1. Previous Update (11/2/2018) - Today's update is about the senior class at Fairmont High School in 1944 and includes one photograph. Previous Update (10/30/2018) - This update shows the extent of the effort to "sell" rationing and sacrificing for the war effort to the American public. It features 33 posters from that time and is located under "History." Previous Update (10/29/2018) - This update tells of Fairmont native Linwood Floyd winning the Silver Star. Two photos are included. The article is located under "History." Previous Update (10/26/2018) - This update features American Tobacco Company's Lucky Strike ad that highlighted Fairmont (photo of ad included). This article is located under "History." Previous Update (10/25/2018) - This update provided an introduction to food rationing by the US Government during World War II and include two information poster from that period. Previous Update (10/24/2018) - This update provides an overview of the US Government's early World War II rationing beginning January 1, 1942 and is located under "History." Sorry, no photos for this one. Previous Update (10/23/2018) - Today's update provides another glimpse of downtown Fairmont, this time in the 1939-40 era. Eight photographs are included. This post is found under "History." 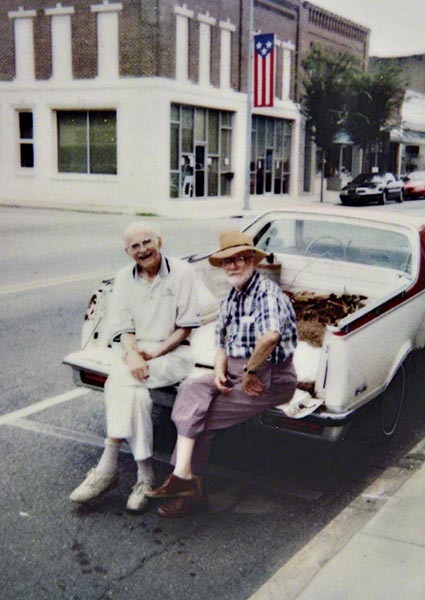 During the past thirty years I have developed a fascination with anything related to Fairmont, NC. Old photos, old newspapers, old buildings decades and old stories all interest me to the point of obsession. This web site is the result of that obsession. Understand that this will be an incomplete history, one that, to my knowledge, has never before been attempted. Rev. W. W. Willis wrote a nice description of Fairmont's settlement and incorporation in a May, 1915 Robesonian, in the process introducing many of the key folks who built the town. P. B. Thompson, one of the first five Ashpole Institute students, filled in some early details in a 1930 Robesonian regarding the Pitman and Stephens lands which formed downtown Fairmont proper. Wiley Taylor added much detail from the 1930's forward for the town's centennial celebration. This was published in a booklet in 1998 in conjunction with the town's centennial. Stories that cannot be verified in print have generally been omitted. "Grandma told me's" have also been omitted absent print verification or multiple sources for the same information. There are bound to be errors here since multiple print sources have disagreed on some events. In cases like that I have tried to use the most sensible, logical interpretation. I will not cite references to specific facts from newspapers, but bear in mind that most of the early research was from old Robesonian newspapers dating from 1897 forward as well as the Lumberton Argus, which published from 1902 to 1905. One copy of the Fairmont Messenger from 1914 proved especially helpful. I used the Times-Messengers from 1947 through 1989 for the more recent history. From all of this, and from a mountain of old photographs and thousands of feet of home movies, I hope to show how this community came into being and try to answer some of the "whys" in our past. Where possible I have drawn on personal conversations with knowledgeable friends such as Billy Whitted, Charles Webster and Thomas Lewis. Their contributions to this work are immense and much appreciated. Through all of this I have had some disappointments. For whatever reason, some have refused to share information that they have. Some have offered, then not delivered. Hence, many details may be incomplete. I think, though, that what is here is really good stuff! If you have anything to contribute to this never-ending project, feel free to contact me and I will try to work it into the narrative. Credit (or blame, depending on how you look at it) for this undertaking ultimately belongs to Billy Whitted, late editor/owner of the Times-Messenger. Shortly after selling the paper to the Dillon Herald, Billy moved his used book store to Main Street across from the bank. There he expanded the business to include all things pertaining to North Carolina. He also had more space for people to come in and chat. Though I had known Billy all my life, this was my first chance to really get to know him. From time to time I would end up in the shop when Charles Webster dropped by for a visit. They would both tell stories about Fairmont and the people here. Charles filled in a lot of blanks from the 1920's, 1930's and 1940's. Billy picked up from there with stories from the 1950's and 1960's. I have often wished that I had recorded some of those conversations. As Billy aged, he began planning for his retirement and departure from Fairmont. Carolyn Floyd purchased the Book Trader but Billy remained there to help her learn the ropes. Knowing my interest in all things Fairmont, he asked one day if I would like to have a few negatives and pictures from his days at the Times-Messenger. The gift was almost 5,500 negatives and 500 hard copies, all organized in his unique way that only he could figure out. Almost twenty years later, I am still trying to figure out his organizational system but some of the photos are pure gold. I plunged into Photoshop about fifteen years ago hoping to be able to find the hidden treasure in those negatives. Along the way I learned about digital restoration of old photos, which opened more doors to Fairmont's history. Larry Floyd, Pat Floyd, Paul Thompson, Jr. and "L" Floyd furnished more than 2,000 family photos that highlighted some of their prominent relatives who helped shape Fairmont's future. A huge thank you goes to the late Flora Griffin Huff, a lifelong Fairmont resident who was interested in her family genealogy before such interests were fashionable. She fastidiously researched the Griffin, Floyd, Inman and Hill families to learn more about her ancestors as a gift to her children. She also researched the Mitchell, Lewis and Pittman families who were connected to her. The result is Kith 'N Kin, a genealogy which covers most of the founding families of the Fairmont area. Mrs. Huff did this the old fashioned way -- by hand! While some dates were slightly off, it was an inspired work and is a great starting point for researching Fairmont history. She did a remarkable job in documenting a good portion of the tangled, DNA-like double helix of the Pittman family tree. When Jack Mitchell, Jr. learned that I did digital restorations, he brought me many old family photos to fix and digitally preserve. Every photograph had a story, and Jack told the story before he gave me the picture to fix. That was my introduction to the A. N. Mitchell family history. This also reacquainted me with Joseph Mitchell, Jack's uncle who wrote for The New Yorker, and I am pleased to say that several of my restorations appeared in Thomas Kunkle's biography of Joseph entitled Man in Profile. Many thanks to Larry Floyd for digitizing and then sharing with me several thousand feet of home movies that his parents, Janet and P. R. Floyd, made from the late 1930's to the early 1960's. The late James O. (Rusty) Perry gave me some 16 mm film of the 1950 Shrine Sundan Temple Ceremonial parade held in Fairmont in November, 1950. Charles Webster let me copy some of his dad's home movies from Farmers Days in the early 1950's. Sylvia Oliver Huggins also provided some Farmers Day movies from the 1950's as well as some negatives of the dignitaries attending the events. Larry Floyd provided a digital copy of the Jake Shockett Day festivities that the club held in Jake's honor. There are many who have allowed me to make a copy of a photo or photos that appear here. Where possible I have included their name in the caption as there are too many to list here. A special thank you goes to Mildred Rouse, Ann Tedder and Margaret Bond, my high school English teachers for their constant efforts to improve my prose and to Gladys McDaniel and Becky Rawls Greene for cultivating my interest in history. These ladies are an example of the caliber of instruction then available at Fairmont High School. Thanks also to Johnnie Daniels and his staff at the Dillon Herald for allowing me access to the Times-Messenger archives, the only copy that I have been able to locate. Given the problems that they have had with people vandalizing their archives, Johnnie was nevertheless happy to allow their use. It would have been extremely difficult to complete this project without this access and I will be forever in their debt. Finally, to Jim Pate and "L" Floyd, my heartfelt thanks for keeping me on track when I just wanted to throw up my hands and walk away. "L" has provided access to many Floyd and Pittman family treasures that reinvigorated me at just the right time. Jim provided perspective on late 1700's and early 1800's history of North Carolina and Robeson County. In addition, he is my grammarian and BS detector who has kept me from wandering off into the weeds on many occasions. Jim has contributed several articles to this endeavor. As you can see, there is no charge to access this information. Donations are welcomed but not required as I would like to maintain this site for the future after I pass away. Your feedback is always welcomed and will be published here if merited. 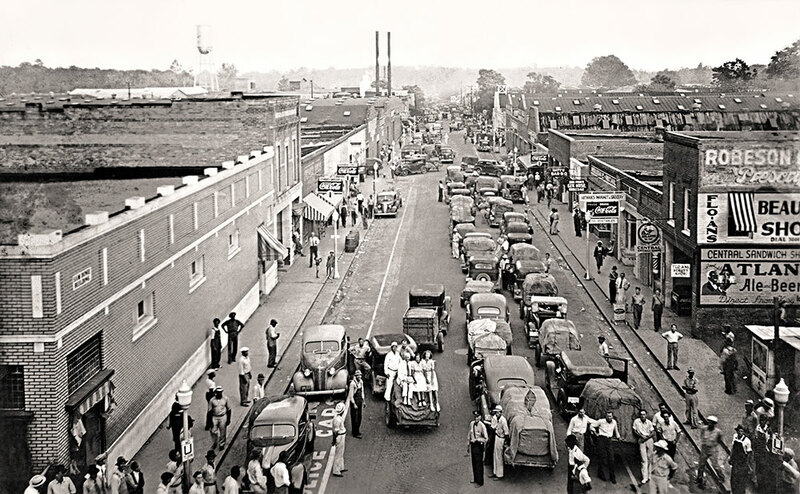 This history of Fairmont, NC has taken four years to put together. I don't pretend that it is a complete account but it is a comprehensive one. In addition to the research required, many of the photographs presented here required significant work to get them viewable. Many are owned by people other than me and are restricted in their use by others. With this in mind, please observe the following rules for using this site. Accessing this web site beyond this point is deemed to be consenting to these terms of service. Do not copy any photo and display it on the internet or email it. All photos here are digitally watermarked by Digimarc, which searches the web for photos used without permission. Do not save a photo and try to print it out. It won't look good at all when you do. I will happily sell you one. Our prices are reasonable for 5x7 and 8x10 photos and I guarantee that they will look better than what you can steal and try to print yourself. Email me for permission to display one of our photos on your web site so as to keep our lawyer happy. There is no charge to use a photograph but I want to know where it will appear and for how long. I prefer that you post a link on your site to our site, either to a specific photograph or a specific article. This will help tremendously with page rank on Google and get us noticed more broadly. Hit the donate button if you like what you see and read here. The site is free for everyone to use but it's not free to maintain and keep on the web. Comments are not enabled and will never be. Email me with comments and criticisms. Eventually there will be a section where the best or most significant ones will be posted, but it won't be right away.